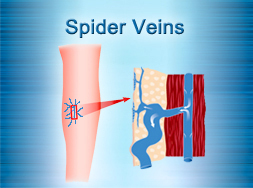 Spider vein treatment in Riverview FL – Spider veins are caused by a deeper vein problem called venous insufficiency. Removing spider veins and not treating the venous insufficiency that caused them, can result in your spider veins coming back after you have had spider vein treatment. 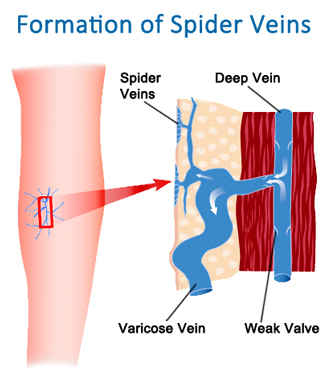 The spider vein specialists at The Vein and Vascular Institute of Riverview diagnose and treat venous insufficiency using endovenous laser ablation, then perform spider vein removal using sclerotherapy injections…this way spider veins will not come back in the treated area again. “Hi this is Thomas Kerr, coming to you live again. I would like to talk today about spider veins. 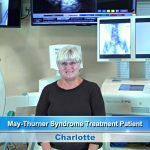 I get asked from a lot of people…from physicians, from normal people, to patients…why do I have spider veins, are they a problem, how do I treat them, what are some of their causes, and what are some of the concerns about spider veins. Spider veins are the most smallest veins we have on the superficial aspect of our leg. People call them spider veins because they’re actually little dilated veins that you can see on the outside of your skin that look like little spiders. But they are actually small little dilated veins that are in your skin. They are not normal and they are not supposed to be there. 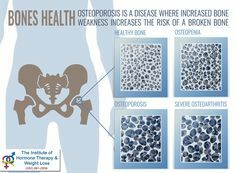 The old misconception was that they are cosmetic or insurance will not cover fixing them, or your family practitioner or your friends would say they are just superficial, do not worry about them. So I get a lot of questions to do I not worry about them, to I don’t like them there can I get them taken care of even if they are superficial. Well, here are some of the real facts on spider veins. 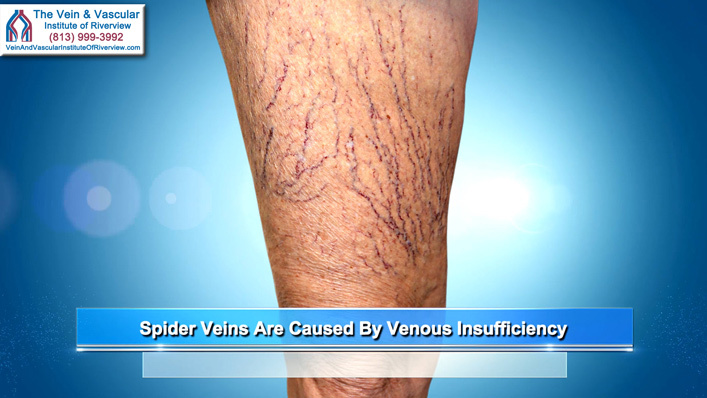 Spider veins are part of a disease called venous insufficiency. 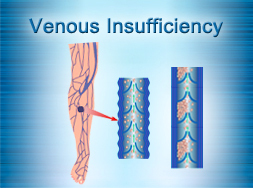 What is venous insufficiency? 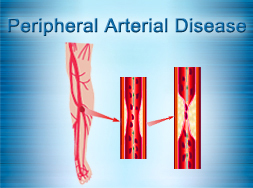 The way your circulation works in the lower extremities is the arteries from your heart pump blood down to your feet. Then once the blood gets down to your feet it gets down there by arterial pressure and by gravity. Well now the blood is down at your feet and has to come back uphill back to your heart. That’s the work, the hard work of part of your circulation called the veins. The veins carry your blood from your feet back up to your heart. Thinking about physics, how can the blood come from your feet, straight up against gravity to your heart? Well think of your veins as a tube going from your foot to your heart. This tube has one-way valves that open and close. 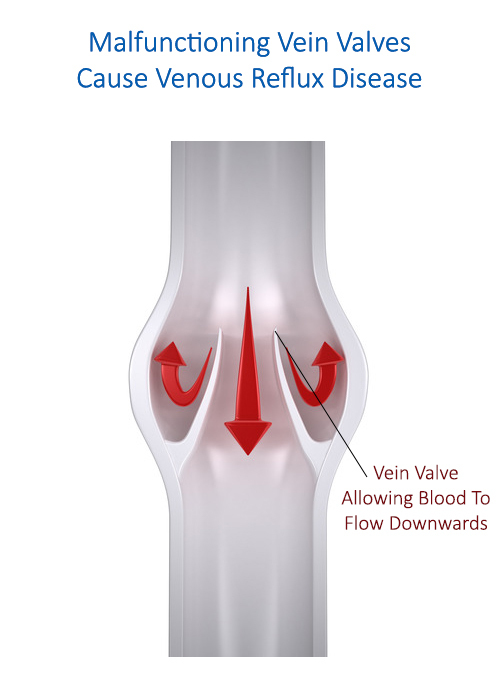 Every time the muscles in your calves and legs squeeze on this tube the little doors on the valves open and the blood is pushed up towards your heart. As the muscles in your legs relax the valves close. Well here is the beginning of spider veins and venous insufficiency. Some patients, because of heredity, age, weight, hormones, standing, childbirth, these little doors start to not close. 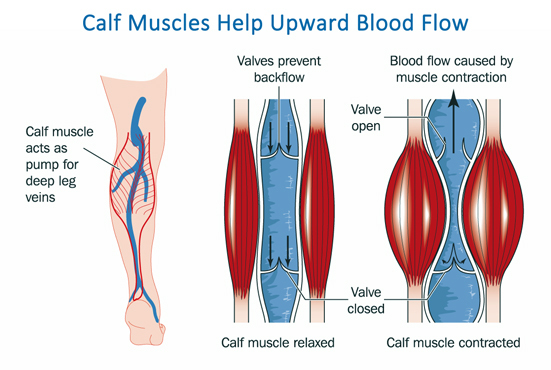 What happens then, the blood gets pushed up but it can run back down through these open valves so you are having a lot more pressure pushing on the veins in your lower extremities than normal. Now that there is pressure in these veins, what happens to the blood? Where does it go? It is pushed out into the tissue. When it pushes out into the tissue you see the blood back up into spider veins. You see swelling. You see three things happen…stuff you see such as spider veins or varicose veins. The venous insufficiency causes stuff you feel such as pain, swelling, heaviness, aches, restless legs, numbness, tingling, aching or burning. And the third thing that people don’t think about when that blood is going down and not circulating completely back up all in one fell swoop is, the blood can clot because it is kind of stagnant. And if in fact that blood clots in your lower extremities, it can break off and go to your heart causing what we call a pulmonary embolism which can even be fatal. So, what do we do about this? You just have spider veins you say. I don’t like the way they look doctor, what should I do about them? Well, you may have had injections but they didn’t go away doctor. I get a lot of questions like this. Why didn’t they go away when people had the veins injected? I will tell you why. This is just like, in Florida we had something here a couple of years ago called the Gulf oil leak where 4-5 miles down in the Gulf of Florida a cap came off of a big oil pipe. So thousands to millions of gallons of oil were leaking deep under the surface. As that oil traveled up to the surface we saw the oil on the top of the Gulf of Mexico as a film of oil across the top of the whole Gulf. Well picture spider veins just like that and venous insufficiency like the leak down below in the Gulf. If we went along and scooped off all that oil on the top of the surface would we have cured the oil leak that is 4-5 miles down? No, it would return. Same thing with spider veins. You inject them with certain chemicals they get absorbed and resolved for a few months or a few days or not at all but they come right back. Why? Because of the venous insufficiency, the venous leak. 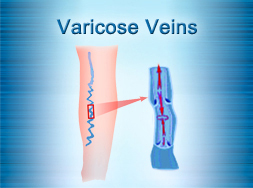 The venous pressure from below inside your deep veins pushes more fluid up to the surface causing more spider veins. So that’s why they come, that’s why they are there. Are they dangerous? Well, they are dangerous in the sense that they can rupture and bleed, they can cause symptoms such as pain, swelling, cramping, burning, tingling and the biggest danger is that they are a tip-off that you have a problem with the veins in your lower extremities…with your deep venous system, venous insufficiency. So what do we do about them? You’ve got spider veins. 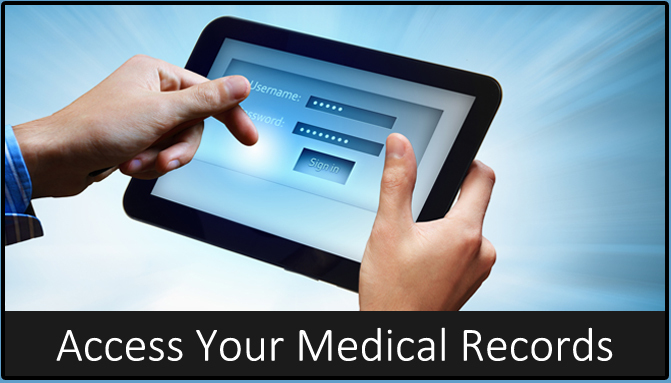 Whether you don’t like the way they look, whether you’re worried about having a medical complication from them. What do we do about it? Well, the first thing we do is we make a diagnosis. We have to have some way of looking at your veins inside your legs to see if you have leaks. 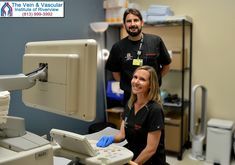 At The Vein and Vascular Institute of Riverview we have the most sophisticated, latest and modern ultrasound equipment available. 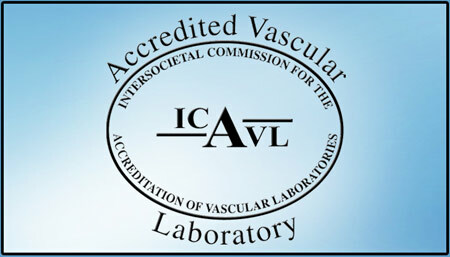 Our vascular laboratory here is Nationally Accredited and it is an ICAVL Accredited Certified Lab with physicians like myself having passed a special board examination to interpret the results of vascular ultrasound and I’ve also written a book on how to do the venous ultrasound. 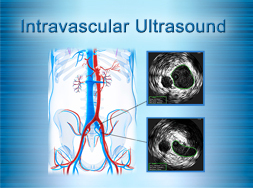 So we are pretty savvy at looking at your veins from an ultrasonic point of view. So number one, we get an ultrasound. We can actually look and see if your veins are leaking. We can see the valves opening, the valves closing and how long it takes for them to close. We can see if you’ve had old blood clots before. We can see where the spider veins are originating from. 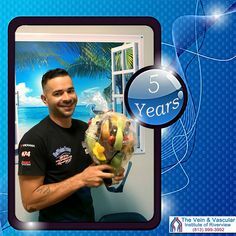 Once we make this determination then we decide the best course of action to treat the venous insufficiency causing either spider veins, symptoms or even possibly a blood clot you’ve had in the past or you can have in the future. How do we treat them? 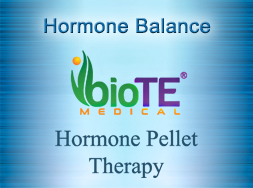 There is a variety of treatments. The first thing we recommend is that when you can, you have your legs elevated. We like the position you should be in, that is called the recliner position where you’re sitting back and your legs are up. 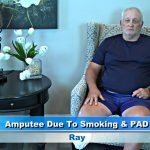 This is the way most people should sit in general with venous insufficiency…stimulating the blood to return to the heart. Number two, we like you wearing compression hose all the time. From the time you wake up in the morning to at least dinner time. 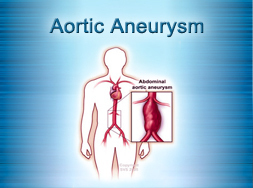 This causes compression on the veins and the valves and helps the blood flow backwards. It also helps your leg not swell during the day. 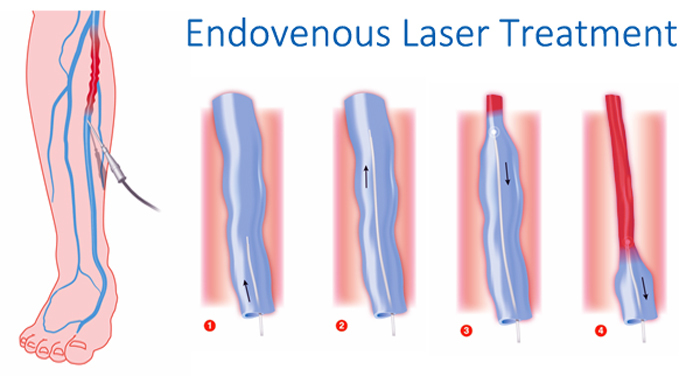 Three…if the ultrasound shows that you have bad veins on the inside of your legs we can actually take a laser at The Vein and Vascular Institute and put a small laser fiber in the bad vein and actually weld that vein shut. Basically, to explain that to you. It is like your blood is flowing into a bucket down in your feet. The bucket is your veins bringing the blood back up to your heart. This leaky vein that we find is a hole in the bottom of the bucket. So you’re bringing most of this blood back up, but there is one bad vein in there that makes the blood leak backwards…like a hole in the bottom of the bucket. That laser welds that hole or that vein shut. 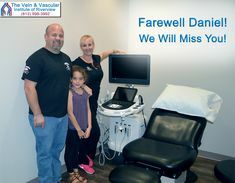 Now you don’t have that vein leaking blood back down your leg causing the spider veins, varicose veins or the symptoms. The blood then can go up into the thousands of good veins you have. I commonly get asked, what if I need that vein? Do I have enough veins Dr. Kerr? That vein, once we have determined that it is diseased, it is not useful for anything. It’s just there. It’s like your appendix. 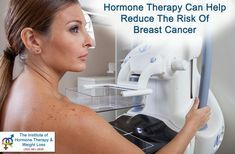 It’s not useful and it can cause harm. 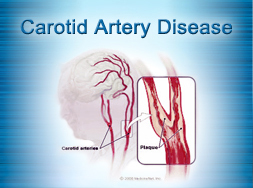 You can get blood clots in it and it’s causing a lot of the symptoms. 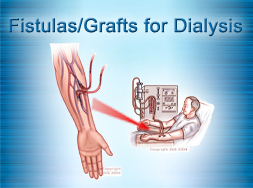 We eradicate that bad vein which we can’t use for bypass, we can’t use it for anything. 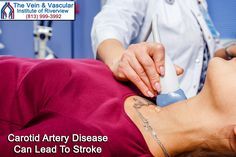 You have plenty of other veins and arteries in your arms and legs for bypass surgery if we need to perform bypass surgery. 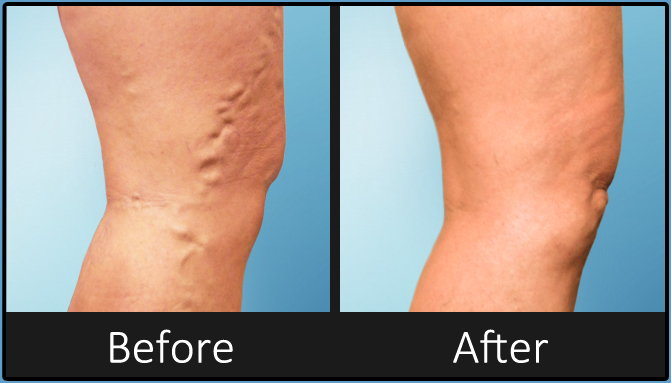 If you have spider veins and would like them removed, at The Vein and Vascular Institute of Riverview we provide sclerotherapy injections for removing spider veins safely, quickly and painlessly. 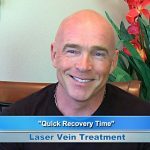 Here at The Vein and Vascular Institute of Riverview, we have already treated thousands of patients using sclerotherapy injections to remove their spider veins, and now these patients are enjoying beautiful and healthy legs again. 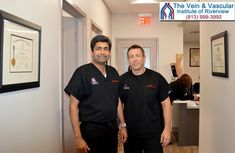 To have a spider vein removal consultation with one of our spider vein specialists, give us a call today at (813) 999-3992 or fill out the form below to request an appointment.